An injury of the spinal cord often has devastating consequences for both the patient and caregiving relatives. While in the peripheral nervous system substantial degrees of nerve regeneration can be achieved, axon regeneration and functional re-connectivity in the central nervous system (CNS) remains a major challenge. Recovery after complete spinal cord injury is very limited even in animal models receiving elaborate combinatorial treatments. 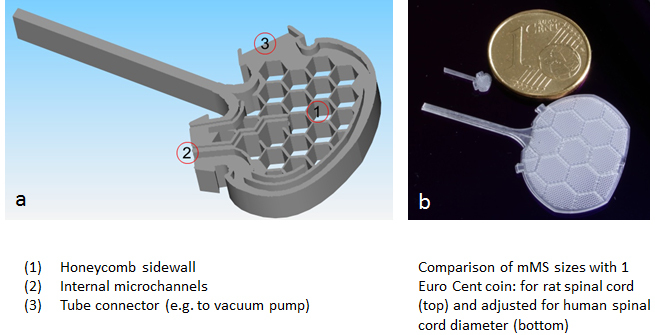 In collaboration with clinicians of the BG Trauma Hospital Hamburg and micro systems engineers from the University of Technology Hamburg-Harburg, Germany, we have developed an implantable mechanical microconnector system (mMS). The mMS was designed to reconnect severed tissue stumps by bringing them into close apposition via low pressure vacuum application. The development and optimisation of the device included testing different materials, methods of fabrication, surface structures, sizes and in vivo application procedures. Finally, an optimum mMS had been designed and characterised, and its suitability for the treatment of SCI was investigated in short- and the long-term rodent studies. Figure 1: a: Schematic representation of the mechanical microconnector system (mMS) and its most important features (1-3). b: The mMS can be designed and fabricated in various shapes and sizes. The photographic image shows the comparison of mMS devices of different sizes with a Euro Cent coin. In our present paper published in Communications Biology, we describe the long-term structural and functional outcome following mMS implantation after complete spinal cord transection in rat. We found that re-adaptation of spinal stumps supports formation of a tissue bridge, glial and vascular cell invasion, motor axon regeneration and myelination resulting in partial recovery of motor evoked potentials and a thus far unmet improvement of locomotor behaviour. The recovery lasts for at least 5 months remaining significantly superior to controls. Our findings demonstrate that microsystem technology can foster long-lasting functional improvement after complete spinal injury, providing a new and effective tool for combinatorial therapies. As a next translational step to bring the mMS therapy closer to its clinical application it is currently applied in a large animal (minipig) model suffering severe SCI. Both regenerative and inflammatory events will be investigated and the effects on locomotor recovery will be analysed to investigate suitability for application of the mMS in larger sized spinal cords. Future plans with the mMS device include its fabrication with bioresorbable materials ideally via 3D bioprinting. The mMS can already be fabricated in various shapes or sizes. 3D printed bioresorbable systems would, therefore, be ideally suited for personalised medicine, where they could be designed according to MR images of, e.g., a lesion or the site of a tumour resection, respectively. The application of the mMS is, however, not restricted to SCI. It would be a useful implant for any tissue gap, which needs bridging. Due to its internal microchannel system, which allows one-time or long-term local infusion directly into the centre of an injury, it is also an ideal tool for combinatory treatments. Our group, the Molecular Neurobiology Laboratory at the Medical Centre of the Heinrich-Heine-University of Düsseldorf, Germany, focuses on investigating CNS injury and repair and developing experimental therapeutic strategies to promote axon regeneration and enhance functional recovery after SCI. Brazda N, Voss , Estrada V, Lodin H, Weinrich N, Seide K, Müller J, Müller HW (2013) A mechanical microconnector system for restoration of tissue continuity and long-term drug application into the injured spinal cord. Biomaterials 34: 10056e10064. Brazda N*, Estrada V*, Voss C, Seide K, Trieu HK, Müller HW (2016) Experimental strategies to bridge large tissue gaps in the injured spinal cord after acute and chronic lesion. J Vis Exp. (110):e53331. Estrada V, Müller HW (2016) Bridging large gaps in the injured spinal cord: mechanical and biochemical tissue adaptation. Neural Regen Res. 2016 Oct;11(10):1572-1574.